When books are made into movies, I usually try to read the book before watching the film, but with The Woman in Black I have unintentionally worked my way backwards. I was introduced to the film of the same name, starring Daniel Radcliffe, in 2012. I really enjoyed it and my overactive imagination meant that this dark Hammer Film Production was very frightening for me (just as I hoped it would be). Whilst doing my compulsory post film googling I discovered that The Woman in Black is a West End production. Indeed, it is currently celebrating a run of over 25 years and is regarded to be a brilliantly successful study in atmosphere, illusion and controlled horror. I planned to watch the play in London one day, but still haven’t got around to it (I have a long list to get through!). I was delighted when The Torch Theatre Company announced that they planned to put on a production of Stephen Mallatratt’s stage adaptation once again- they previously produced it in 1999 while I was away at university and the story was less well known. Reading through the programme as I waited for the play to begin I was intrigued to read about how this long running stage play had come to be. Robin Herford was running the Stephen Joseph theatre in Scarborough when he realised he hadn’t spent his entire grant. His boss, Alan Ayckbourn, was off on sabbatical, so Herford decided, with Christmas coming up, to put on a ghost story that could be staged cheaply and quickly – not in the main theatre, but in the bar. 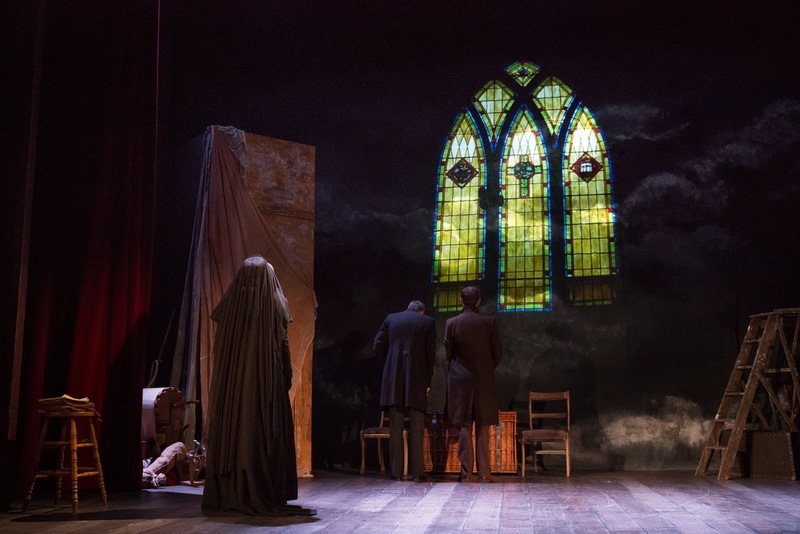 He asked the venue’s resident playwright Stephen Mallatratt to rustle one up, with the proviso that the set and costumes couldn’t cost more than £1,000, adding that there was only enough money to pay four actors. “I’ve got an idea about that,” said Mallatratt. His masterstroke was to make The Woman in Black a play within a play, one that needs just two speaking actors, and a backstage crew of four. 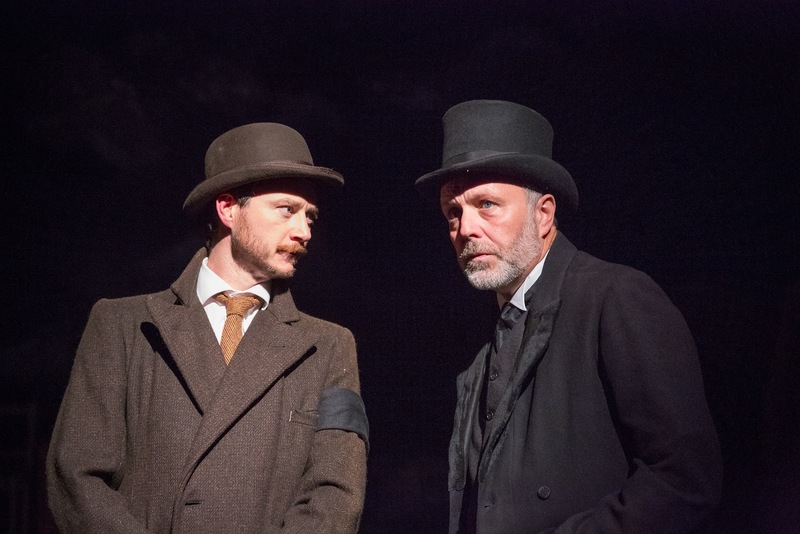 Elderly Arthur Kipps brings a ghost story to a young actor; it’s the story of something that happened to Kipps 30 years earlier, and the actor turns it into a drama. The older actor plays around half a dozen characters, while the other takes the role of young Kipps, a solicitor in the remote town of Crythin Gifford, who has to visit a mysterious house in the marshes to tie up a dead woman’s affairs – discovering all too late why the townsfolk shrink from the place. This play was a sellout and ran for three weeks, a year later it moved to the Lyric Hammersmith and then onto the Fortune Theatre in the West End. As the show is a play within a play, it starts unexpectedly in an empty Victorian Theatre. Our own theatre’s audience lights are still up to make it clear this is just a “rehearsal” and not a very successful rehearsal at that. 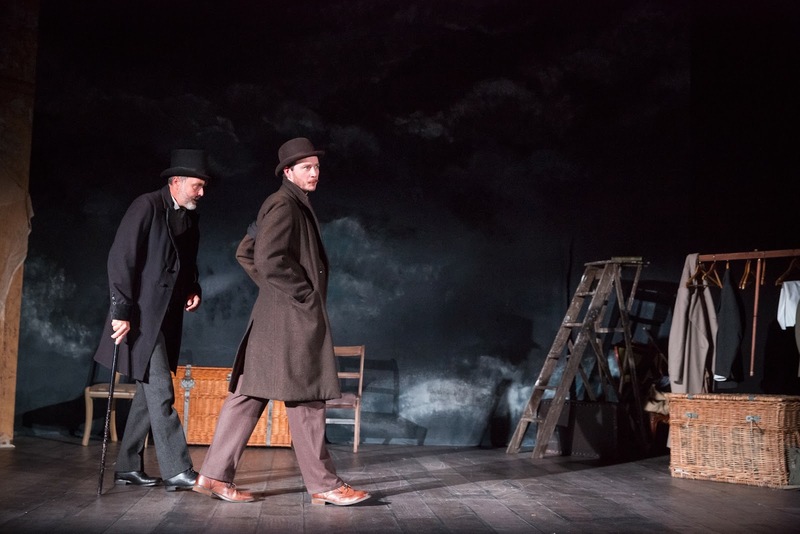 Despite trying to tell his own story in the hope that he will finally be exorcised from his tragic past, Arthur Kipps is criticised by the young actor he has hired to help him in this dramatisation of his real life past events for his underwhelming performance. Eventually a solution is found and the young actor agrees to act the part of Kipps, while the real Kipps becomes all of the other characters. Kipps is far more comfortable playing all the other parts and promises a big surprise to the young actor in future performances. As with all ghost stories, when the narrator at first teases us by stopping and starting we can’t wait for them to go on and when our actors decide that they will “continue all the way through” we feel both delight and fear simultaneously. We settle fully into the story eventually. We truly believe that Rhys Meredith is our Kipps, and Ioan Hefin slips remarkably naturally and wholly believably into each of the other characters. I’ve mentioned earlier that I found it more of a relief when TWIB appeared rather than a scare because like the majority of horror it relies on the “what you can’t see is what will get you” approach. Although the child mortality rate has thankfully improved since Victorian times, this remains one of our biggest modern day fears and worst nightmares. The twist at the end of the play was the one I was expecting but really hoping for the sake of our characters that I was wrong. It is as the internal play comes to an end that the true horror comes to light and we realise Kipps’s surprise was not what it seemed. We realise the true horror is actually what The Woman In Black represents and one that we can never escape. You will have goosebumps and be looking over your shoulder as you walk out of the theatre! I truly enjoyed this play and it marks the perfect start to the Autumn season at the Torch. Starring in the production will be Torch newcomer Miriam O’Brien who is also set to star in this year’s Torch Christmas show Sleeping Beauty. Originally from Coventry, Miriam has recently graduated from the Liverpool Institute for Performing Arts and also performed in the Edinburgh Fringe Festival in 2014 as Green Girl in Shout! Starring alongside Miriam is RADA trained, Rhys Meredith in the role of the actor. He most recently played Jago in Bertie Carvel’s directorial debut Strife at Chichester’s Minerva theatre. Kipps is played by actor Ioan Hefin who last year worked alongside Hollywood legends Samuel L Jackson and Dame Judi Dench after being cast in Tim Burton’s movie, Miss Peregrine’s Home For Peculiar Children. We had the pleasure of meeting Ioan in the bar afterwards and found it very interesting to hear that while this was his debut appearance at the Torch Theatre, it was at the Torch that he saw his very first live play so it’s very apt that we welcome him back here. 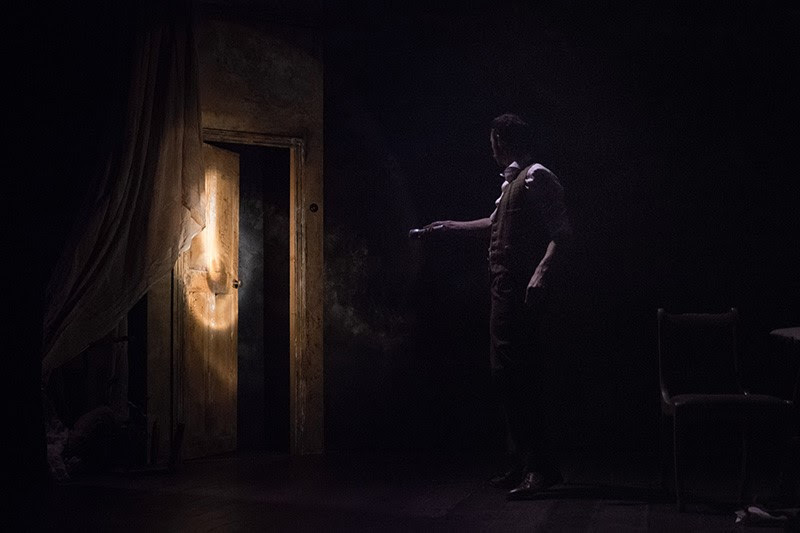 The Torch Theatre Company’s The Woman in Black, by special permission from PW Productions runs from Wednesday 5 October – Saturday 22 October at 7.30pm, with Matinee performances at 2.30pm on Thursday 13, Saturday 15, Wednesday 19 and Thursday 20 October. Thanks to the Torch Theatre for providing tickets for the purpose of this review.